Human path planning relies on several more aspects than only geometric distance between two locations. These additional aspects mostly relate to the complexity of the traveled path. Accordingly, in recent years several cognitively motivated path search algorithms have been developed that try to minimize wayfinding complexity. However, the calculated paths may result in large detours as geometric properties of the network wayfinding occurs in are ignored. Simply adding distance as an additional factor to the cost function is a possible, but insufficient way of dealing with this problem. Instead, taking a global view on an environment by accounting for the heterogeneity of its structure allows for adapting the path search strategy. This heterogeneity can be used to regionalize the environment; each emerging region may require a different strategy for path planning. This paper presents such an approach to regionalized path planning. 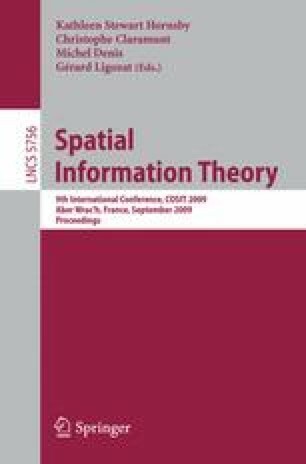 It argues for the advantages of the chosen approach, develops a measure for calculating wayfinding complexity that accounts for structural and functional aspects of wayfinding, and states a generic algorithm for regionalization. Finally, regionalized path planning is demonstrated in a sample scenario.